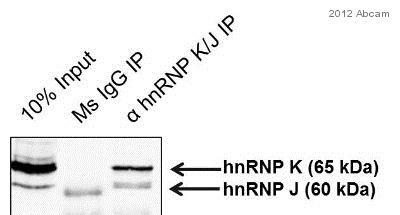 Mouse monoclonal hnRNP K antibody [3C2]. Validated in WB, IP, ELISA, Flow Cyt, ChIP/Chip, ICC/IF and tested in Mouse, Rat, Hamster, Cow, Human, Xenopus laevis. Cited in 13 publication(s). HeLa extracts. This antibody gave a positive result when used in the following formaldehyde fixed cell lines: HeLa. Our Abpromise guarantee covers the use of ab39975 in the following tested applications. WB 1/1000. Detects a band of approximately 65 kDa (predicted molecular weight: 51 kDa). One of the major pre-mRNA-binding proteins. Binds tenaciously to poly(C) sequences. Likely to play a role in the nuclear metabolism of hnRNAs, particularly for pre-mRNAs that contain cytidine-rich sequences. Can also bind poly(C) single-stranded DNA. Arg-296 and Arg-299 are dimethylated, probably to asymmetric dimethylarginine. Cytoplasm. Nucleus > nucleoplasm. In case of ASFV infection, there is a shift in the localization which becomes predominantly nuclear. ICC/IF image of ab39975 stained HeLa cells. The cells were 4% formaldehyde fixed (10 min) and then incubated in 1%BSA / 10% normal goat serum / 0.3M glycine in 0.1% PBS-Tween for 1h to permeabilise the cells and block non-specific protein-protein interactions. The cells were then incubated with the antibody ab39975 at 5µg/ml overnight at +4°C. The secondary antibody (green) was DyLight® 488 goat anti- mouse (ab96879) IgG (H+L) used at a 1/250 dilution for 1h. Alexa Fluor® 594 WGA was used to label plasma membranes (red) at a 1/200 dilution for 1h. DAPI was used to stain the cell nuclei (blue) at a concentration of 1.43µM. Overlay histogram showing HeLa cells stained with ab39975 (red line). The cells were fixed with 80% methanol (5 min) and then permeabilized with 0.1% PBS-Tween for 20 min. The cells were then incubated in 1x PBS / 10% normal goat serum / 0.3M glycine to block non-specific protein-protein interactions followed by the antibody (ab39975, 1µg/1x106 cells) for 30 min at 22ºC. The secondary antibody used was DyLight® 488 goat anti-mouse IgG (H+L) (ab96879) at 1/500 dilution for 30 min at 22ºC. Isotype control antibody (black line) was mouse IgG2b [PLPV219] (ab91366, 2µg/1x106 cells) used under the same conditions. Acquisition of >5,000 events was performed. Publishing research using ab39975? Please let us know so that we can cite the reference in this datasheet.